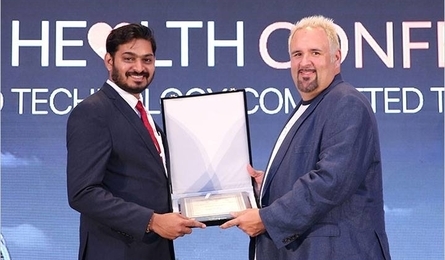 WAFI, UAE - Dec. 27, 2018 - PRLog -- Dr. Bhaskar Rajakumar, Founder & CEO HealthConnect Digital Private Limited was awarded the Top 50 Smart Healthcare Leaders Award for his significant contribution towards the healthcare sector at Smart Health Conference 2018, held at Raffles, Dubai on November 13-14, 2018. Dr. Bhaskar's key responsibility includes the application of his medical expertise to design structured online medical education programs. He oversees development of medical education market gaps, partners and develops the learning pedagogies, and also, ensures reach and delivery to the learners (healthcare professionals). He also oversees operations. When asked how he feels about receiving the award, Dr. Bhaskar remarked, "I am feeling wonderful. It's a great recognition to have received the award from Smart Health. To be recognized among the top 50 leaders in the globe is an achievement in itself. Thanks to Smart Health for recognizing the contribution of all the top 50 leaders in the healthcare industry". He further continued, "For sure, this is going to make a large impact in my career and also in organizational career. So, as a part of my organization, our core aim is to drive the reach of better health education to the doctors. This award has given the access to the larger geographies. As of now we are only focused in India, Australia, Singapore and Philippines. Beyond just the award, the event in itself; we came here and got a chance to network with lot of people that helped us a lot. This for sure is going to help me and also the organization in a great way". Dr. Bhaskar has previously worked as Chief Medical Officer, Consultant Radiologist at multiple hospitals (Between 2007 – 2012). He was also heading the PMO, Medical Affairs – Indegene Life Systems (2010 – 2016). conference concept, brought together the who's who of healthcare and technology industries on a single platform. The second edition ended with the promise of a bigger and better event, next time around.